Insects have three distinct body parts – the head, thorax and abdomen and in most insects it is easy to tell the difference between them. Insects are also invertebrates meaning they have no internal skeleton but instead have a series of external body plates. These are collectively known as the exoskeleton. The pronotum (word of the week) is the first of these plates which make up the thorax. In some insects the pronotum is enlarged. 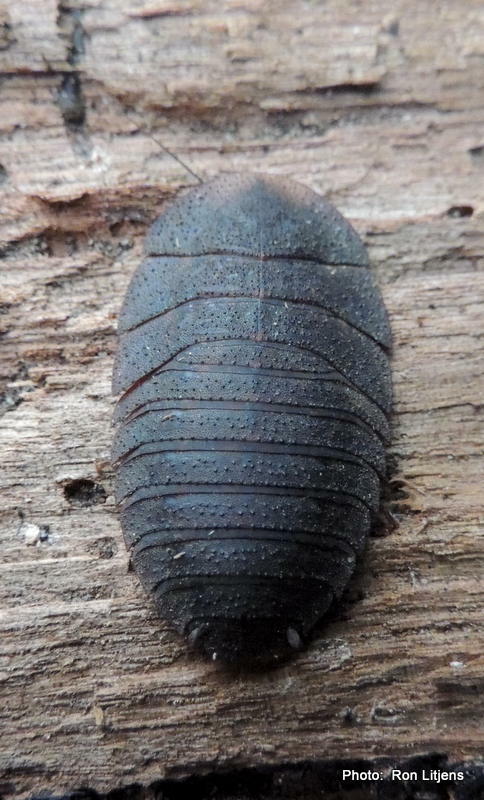 Cockroaches for example have a pronotum which extends to cover the entire head, sort of like a shield. In the photo left, the head of the Bark Cockroach (Laxta granicollis) can just be seen through the translucent pronotum. (Hint: the head is the end with the antennae sticking out). For treehoppers of the Membracidae family the pronotum is even more impressive. 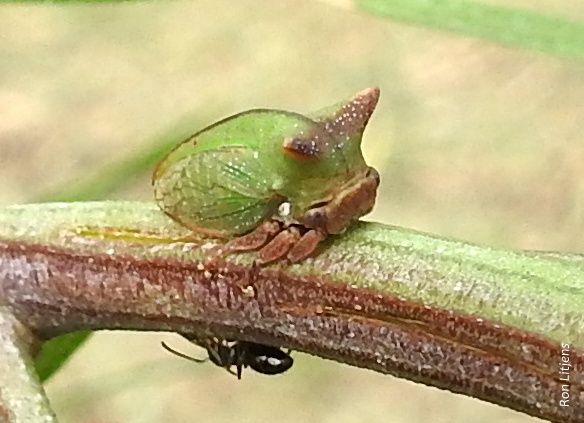 The Acacia Horned Treehopper (Sextius virescens), pictured below, is an example. The pronotum extends forwards and up so as to look like horns, hence the name. It gets better than that though. If you look carefully (picture right) the bright green pronotum also extends all the way down the insects back between the wings. For those familiar with the 1979 sci-fi thriller Alien it is not hard to see where the inspiration for the head of the Alien creature may have come from. For those interested in the attendant ants, treehoppers are Hemipterans, sap-sucking insects which exude a sweet substance called honeydew. 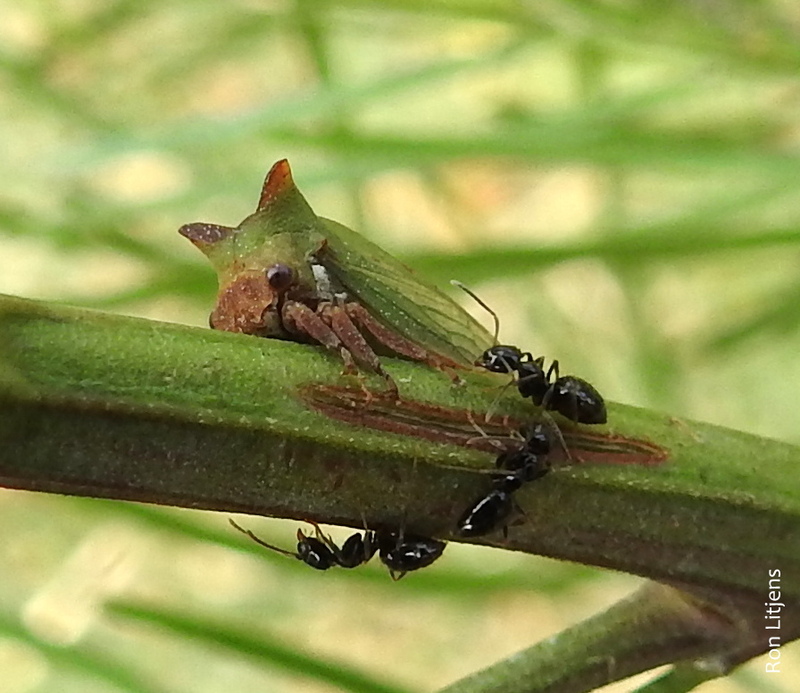 The ants collect the honeydew for food and in return protect the treehopper from predators and parasites. Your challenge now is to use the word pronotum is your everyday conversation without anyone noticing. ← Going in to bat?